I am free all day on Saturday and Sunday, and the weather looks to be pretty decent on those days. Going to the No Prep Nationals at HPT Sat for a friends bachelor party. Probably just stay out in Topeka depending on how late we stay out. Sunday Maybe, but probably going to be a recovery day at this point. Thanks to Chuong I got an invite to the races. These were runs off of the bottle. I didn't get a chance to run any of the fast cars because a turbo LS Fox threw a rod through the oil pan and sprayed oil all over the "track" and that ended the day. Is this a spot up north? You a cop or something, bro? I ended up working all afternoon yesterday. Almost bailed out to go out there. On the plus side, I got the screw/leak fixed that was in my front Pas tire. Brian Spilner is the name, racing is the game. He was coming around. Had he not let off he would have come by in another 300 feet. He had the performance package, so 373 gears vs my 331’s, a catback and I think he said a tune...but I could be wrong. It was my first time out with that group, and once I told them I had nitrous people’s butts started puckering up when talking mods and wanting to run. I was honest each time. I’m on street tires and can’t spray it out of the hole, but if you’re in front of me when I hit 60mph I’m spraying it. Last edited by jwdb1fish; 2018-11-07 at 08:09 PM..
Just in time for some snow! I bought a DD so the Mustang has been retired to race and cruise duty only. It’s a totally different car on these tires. Sunday is the last Test and Tune of the season out at HPT. Looks like it is going to be pretty cold though. I’ve only been to Heartland Park for test and tune a few times, and that was years ago. Will they run if it’s below 50 degrees out? I’m showing a high of 48 Sunday, but I’m down to run if they’re open. 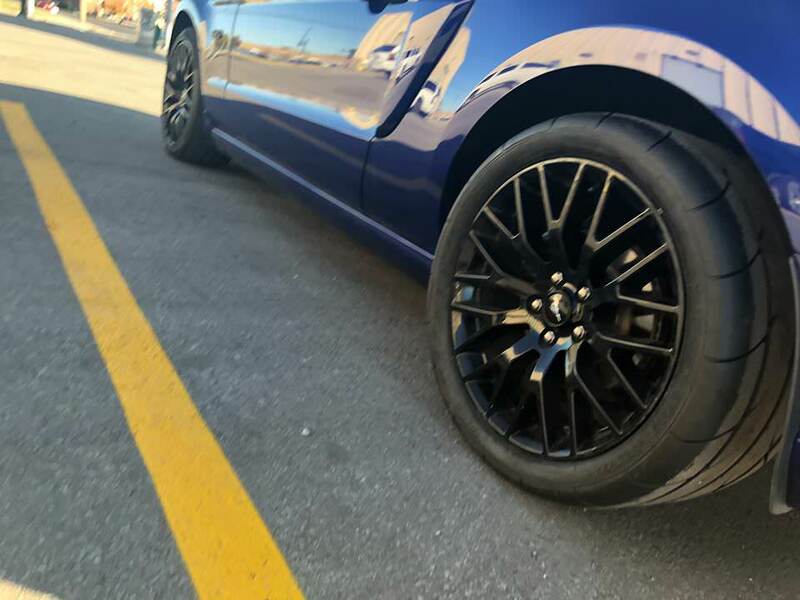 Love the tires! I went from a 12 year old summer performance tire to a new Potenza RE71R and it was amazing the difference it made especially in 2nd gear. Last edited by jwdb1fish; 2018-11-17 at 08:35 AM..
That Kia moves pretty good! I won't clutter up the Stinger thread any more with our back and forth, so I'll bring it here. Tuned Kia got you scared enough your building the motor? Actually, cars these days are just super quick, and power levels out there are crazy. After attending a few street racing events the past few months it's apparent that I need more than what I have to hang with the group I want to hang with. The build should get me to 525/450 to the wheels, and be pretty bullet proof with whatever I want to spray it to. I want it to trap 125 NA and 140+ on the bottle. Should be a fun little setup. It is pretty crazy how fast the average car is, especially with just a tune, etc. My Camaro wouldn't have enough for the Kia I'm sure.